The Munster Reds have made one change to their squad from last week’s washout against the North-West Warriors, ahead of their trip to Merrion CC to take on the Leinster Lightning Friday evening (5pm). The Reds’ schedule thus far has been rain-affected, with bad weather on Leeside ending up in a win on Duckworth Lewis for the Northern Knights, while not a single ball was bowled against the Warriors, as a torrential shower began 30 minutes before start and persisted for the evening. Clear weather is expected for the side’s biggest test thus far, coming up against reigning champions Lightning who already top the table with two wins and a bonus point in their first two games. This is the middle game in a busy schedule for the Reds, who travel to Eglinton to play their away fixture against the Warriors on the 23rd. Arslan Anwar replaces the unavailable Gary King and comes into the side on the back of recent impressive performances for County Kerry in Munster league and Irish National Cup games, including 145* against Midleton a few weeks ago. David Delany is set to bowl his first over for the side as well after last week’s washout, and Morne Bauer will also be looking for his first opportunity to show what he brings to the IP20 competition. Munster Reds Squad to face Leinster Lightning: Stephan Grobler capt. (Cork County), David Delany (National Academy/Clontarf), Arslan Anwar (Co Kerry), Morne Bauer (Cork County), Yaqoob Ali (Co Kerry), Robert Forrest (Clontarf), Nicolaas Pretorius (Phoenix), Rory Anders (National Academy/Phoenix), Jamie Grassi (National Academy/North County), Max Neville (National Academy/Merrion), Harry Tector (National Academy/YMCA), Jack Tector (National Academy/YMCA). 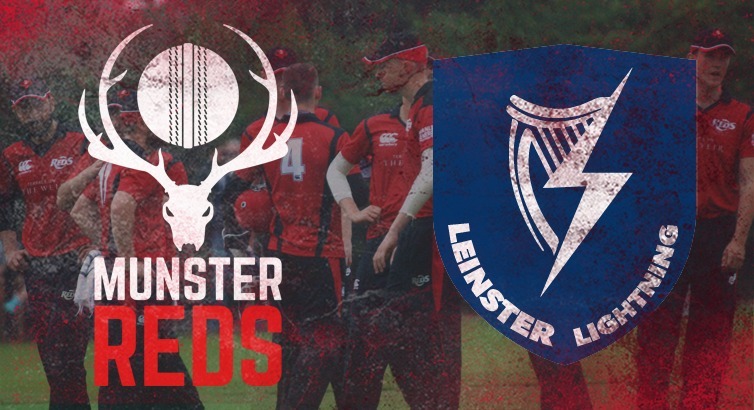 Leinster Lightning v Munster Reds, Merrion CC, Friday June 16th, 5pm.